The All State earned second place for Best Magazine Spread — which is a design crossing over two side-by-side pages — and third place for Best News Delivery — which is distributing information on a single event through social media — for the special edition. Other colleges and universities placing in these categories were Indiana University, University of Portland, University of Alabama and Miami Dade College. “I think this shows our students are continually competing on a national level and earn awards alongside reputable journalism programs,” Patrick Armstrong, coordinator of Student Publications and Marketing and adviser to The All State, said. The student newspaper previously earned six national awards at the Fall National College Media Convention and five regional awards from the Southeast Journalism Conference, totaling 13 awards for the academic year. The All State earned second place for Best Magazine Spread and third place for Best News. 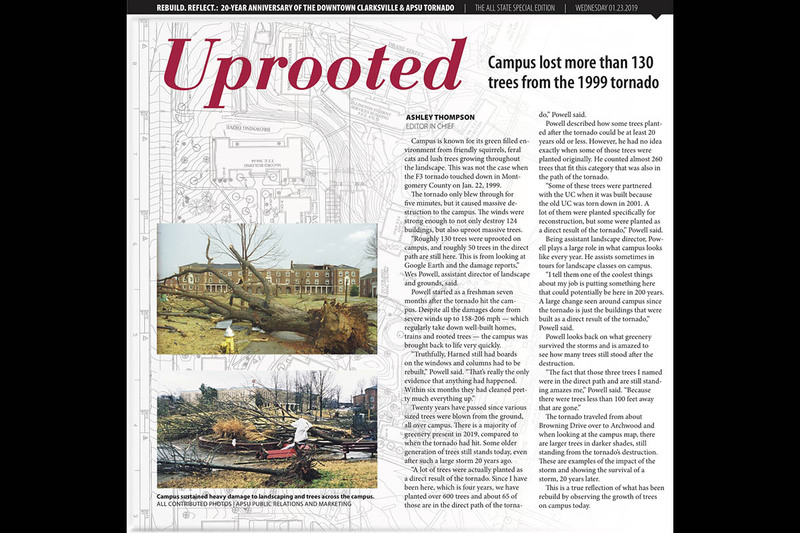 “Rebuild, Reflect” featured impactful numbers from the tornado, various personal reflections from alumni and Clarksville Mayor Joe Pitts, and online interactive elements such as a map of damage, image comparison sliders, photo galleries and past coverage. On January 22nd, the 20-year anniversary of the tornado, The All State’s Facebook posts reached more than 12,000 people. The special edition was sponsored by Coca-Cola Bottling Works of Tullahoma, the official soft drink provider of APSU. To view The All State’s online coverage, visit www.theallstate.org/1999-tornado-20-years-later. Copies of “Rebuild, Reflect” are still available in Student Publications, located in the Morgan University Center, room 111. Austin Peay was also the only Tennessee college and one of four Southeast Journalism Conference member colleges to earn Apple Awards. More than 1,200 student journalists and advisers were in attendance from more than 150 colleges and universities. Armstrong attended the convention and presented a session on illustrating hard topics and stories in student media. He currently serves on the national finance and fundraising committees for the College Media Association. The All State student newspaper publishes each Wednesday in print, and is distributed on APSU’s Clarksville and Fort Campbell campuses. 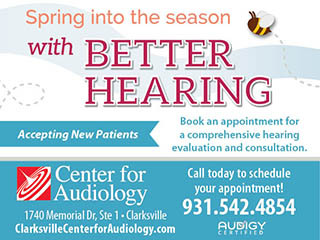 It publishes regularly online at www.theallstate.org. 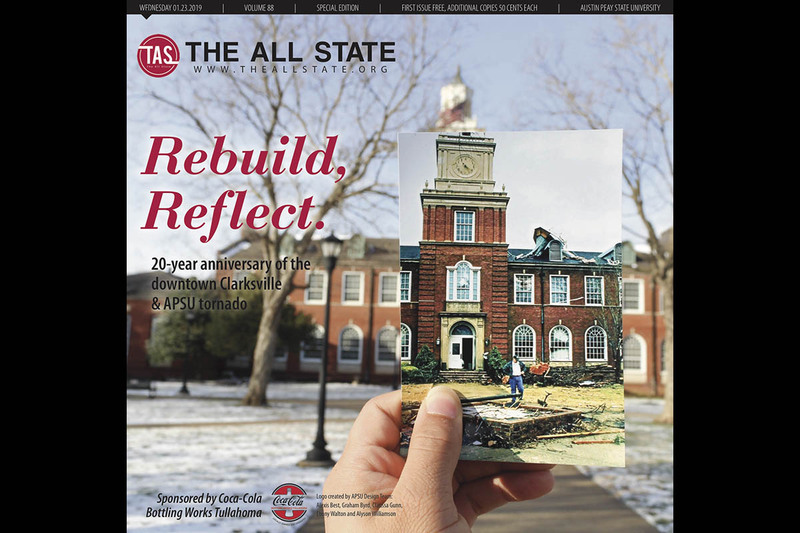 Readers can connect with The All State on Facebook (@theallstate), Twitter (@TheAllState) and Instagram (@TheAllState_APSU). The All State is housed in the Department of Student Publications, a part of the Division of Student Affairs.